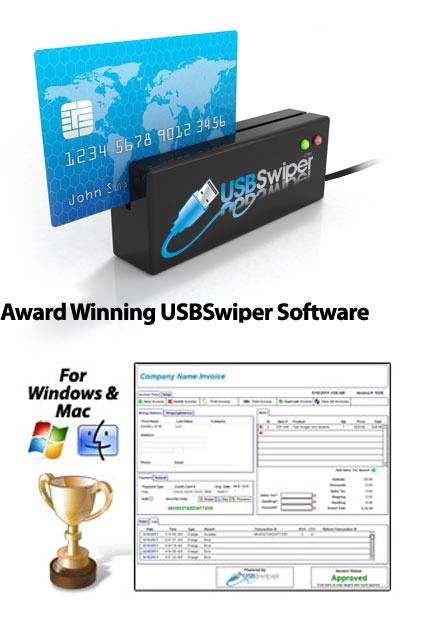 Compare our many benefits with any other system and you will see why so many business owners choose the USBSwiper credit card processing solution. Works on Both PC and MAC Platforms. Data Inventory Management System Allowing you to export Information to Excel Spreadsheets or your Quicken or Quickbook Accounts. Allows you to easily "swipe" credit card transactions using your desktop or laptop computer and an affordable credit card reader. Automated email receipts sent to your customer! Allows you to store all your products, prices etc. in a convenient drop down menu for easy invoicing. Allows you to take and store credit card transactions even if you lose or don't have internet connection. Then you can process when internet connection is available. Built in Bar-Code Scanning Capability. Invoicing system allows easy receipt printing for all your transactions. Can Turn Off Monthly Gateway Fee For months when not in use. This saves you the monthly fee charged by the merchant account. USBSwiper Does Not Lock You Into Any Long Term Contract. USBSwiper Has NO Cancellation Fees. NO Expensive Hardware to Lease or Purchase. You can have hundreds of terminals from multiple locations all feeding into one merchant account. Can integrate all your Website Sales and Point of Sale Transactions into one single merchant account. Same Low Costs for Both Wired or Wireless Terminals. We can tailor a merchant account to your business to provide the lowest rate available for your transactions. Whether you're looking for a variable or flat-rate merchant account, USBSwiper has the right program for you. USBSwiper uses flexible pricing that covers major credit cards and will save you money! with a single merchant account."